According to the Australian Institute of Criminology, around 200,000 breakins are recorded across Australia each year – an alarming figure (pun intended!). And regardless of where you live, the construction of your home, and how much time you actually spend on your property, it’s still an important issue to consider, both for your family and for your valued possessions. Here are 7 effective ways to increase home security. #1 – Use Common Sense! 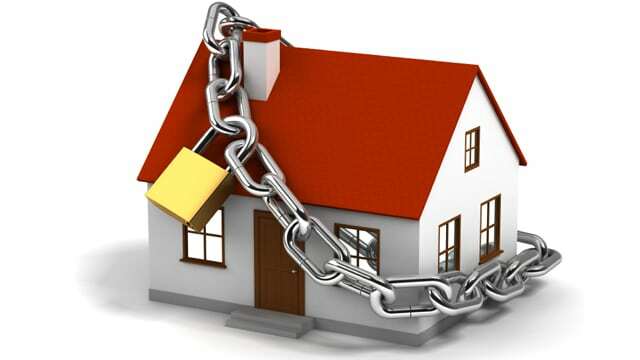 It’s the most basic of home security tips but ironically one that’s often overlooked – lock things up. Regardless of whether you’re just popping out to do some shopping, or off on a weeklong holiday, make sure your home, garage, shed, windows and doors are secure. If you’re off on holidays in particular, never leave an answering machine message saying you’ll be away, and don’t advertise it on social media either – check your privacy settings before you go, disable location services, and above all, be mindful of the photos you share. It’s also worth making sure your house still looks ‘lived in’ by asking a trusted neighbour or friend to collect your mail, put out your bins, and keep an eye on things while you’re away. Almost two thirds of home break-ins are due to weak locks being used on doors, which is why when it comes to your home’s security systems, you should ensure that all exterior doors have the best locks possible. Investing in Grade 1 deadbolt locks will not only keep your family and belongings safe, but will deter thieves. Digital, electronic or ‘smart locks’ that take advantage of digital technology are also worth considering. These essentially have the same locking mechanism as mechanical locks, however, their most common feature is that their primary method of operation is not by using a key. Digital and electronic locks are mostly stand-alone, meaning they’re not connected to the outside world via the internet, and their primary method of operation is usually by keypad, an access card or a fingerprint sensor. Smart locks, by comparison, are almost always connected via at least one of the following – a home automation router, the internet (usually Wi-Fi), GSM (usually a SIM card) or Bluetooth (usually via a Smartphone and an app). Security screens not only help keep flying insects at bay, they’re also a great way to increase security at home, however there are a number of components to security screens that should be considered before you purchase. Security screen frames can be constructed of steel or aluminium, and security experts generally maintain that a steel security screen (if properly constructed and installed of course) is the most effective, particularly if it meets Australian Standards as this also means it will be corrosion-resistant. It’s worth noting however that in most states, the term ‘security’ advertised on many products is actually meaningless unless these products can be shown to meet the Australian Standard AS5039-2008, and are installed using the standard AS5040, so check these apply before you buy! Many burglars looking to break into a home often keep a close eye on a home’s occupants and their daily habits. Motion detector lights are generally integrated with sensors that detect any change in movement in a specific area, and will turn on automatically if something or someone triggers them. ‘Smart’ security timers can also increase home security. These devices are most often app-controlled and can be monitored from anywhere provided you have sufficient Wi-Fi connectivity in your location. They can be attached to not only lights but also electronic appliances like TVs and radios, and can be turned on and off at predetermined times throughout the day. Basically, they keep your home looking occupied, even if it’s not! Security cameras have come a long way, and most now come with software that enables you to access both video and photos through your Smartphone, tablet and/or computer from any location. Most of them work by notifying you via SMS, MMS or email when they’ve detected movement and there is footage to be viewed. Wireless security cameras can be placed pretty much anywhere in your home without ethernet cables, and some even run on batteries. Many of these will store recorded footage on a memory card on external storage drive that’s connected to the camera, and some offer even better security by taking the images off-site and immediately saving them to an Internet-based remote storage hub. There are a huge variety of security cameras out there, but some things to bear in mind before you invest are the device’s image quality, its night vision and motion detection capabilities, and whether it can tilt, pan and zoom. There are a range of range of security alarm systems on the market, and they fall into two basic categories – monitored and unmonitored. Unmonitored security systems work by sounding an alarm if triggered, which draws attention to your home and hopefully scares off any intruders. These are particularly useful if you live in an area where properties are built close together, and your neighbours are vigilant enough to contact the police if the alarm sounds. Monitored security systems allow you to increase home security and ensure that action is taken to protect your home around the clock. Upon the detection of an intruder, these work by alerting a security monitoring centre which will then call you, another emergency contact, or the police if you are not contactable. #7 Call In The Experts! Still confused about the best way to increase home security? Queensland owned and operated, Vincent Security has been in business for nearly 50 years, and are committed to working with you to provide the best home security solution for your home, business or commercial needs. We’re Brisbane’s barrier security specialists! Need to amp up the security in your home? Contact the experts at Vincent Security today on (07) 3849 4555.